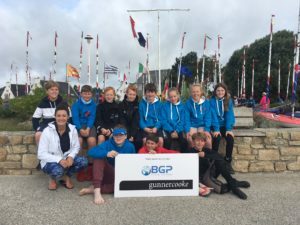 BGP are proud to be sponsors of the 4.2 UK National sailing team, who recently sailed at Loctudy in France. Sean Woodard won the 4.2 World trophy with all UK sailors achieving top 30 world rankings. Teams came from around the globe, including China, France, Italy, South Africa, Macau, Ireland as well as the UK, to name a few. The 4.2 team, all aged between 11 and 13 (pictured below) all showed great determination, and battled some challenging sea conditions all led by their coach, Charlotte Bonella. The Topper is undeniably one of the world’s fastest growing youth boats with over 200 competing at this year’s world championships. 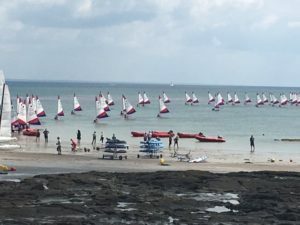 Even though the level of competition is intense, the primary focus has always been centred around the enjoyment of sailing as a sport and the promotion of friendship and camaradery across nations. 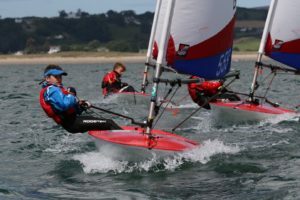 The Topper is a recognised ‘pathway boat’ for RYA selection to the Olympics. The team have continued to succeed with Cameron Sword winning the Dixon 4.2 Trophy at the UK Nationals in Pwhelli a week later and also came second overall in the UK Nationals, followed by Tim Evans and James Smaggersgale. Again, led by the UK National 4.2 coach, Charlotte Bonella. South East Toppers now intend to build on their success, and will continue to do so through the winter with training supplied via the RYA and ITCA. Next year the team have been invited to compete in China where we are confident the UK will continue to achieve even greater success.